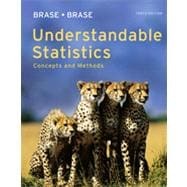 UNDERSTANDABLE STATISTICS: CONCEPTS AND METHODS, Tenth Edition, is a thorough, yet accessible program designed to help readers overcome their apprehensions about statistics. The authors provide clear guidance and informal advice while showing the links between statistics and the world. To reinforce this approach--and make the material interesting as well as easier to understand--the book integrates real-life data from a variety of sources, including journals, periodicals, newspapers, and the Internet. Readers also have opportunities to develop their critical thinking and statistical literacy skills through special features and exercises throughout the text. The use of graphing calculators, Excel?, MINITAB?, and SPSS? is covered for those who wish to learn about these helpful tools. Focus Problem: Where Have All the Fireflies Gone? Focus Problem: How Often Do Lie Detectors Lie?